Mercedes will begin output of the CLA compact coupe alongside the B class at its plant in Hungary (shown). BUDAPEST (Reuters) -- Mercedes-Benz plans to expand its car plant in Hungary to double annual production to 300,000 vehicles by 2015, business newspaper Napi Gazdasag said on Thursday, citing three unnamed sources familiar with the matter. Mercedes said in March that in addition to its B-class compact it would also start producing the CLA compact coupe, dubbed the "baby CLS," at the Kecskemet plant starting in 2013. The report said trial production of the coupe had already started at the plant. "Yes, it's true we can expand the production line, but no decision has been taken on this matter," a Daimler spokesman told Reuters when asked about the report. The automaker is seeking to boost volume sales and make the brand more attractive to younger buyers by expanding its premium compact lineup from two current models -- the A class and B class -- to five cars, including the coupe and later an SUV and shooting brake. 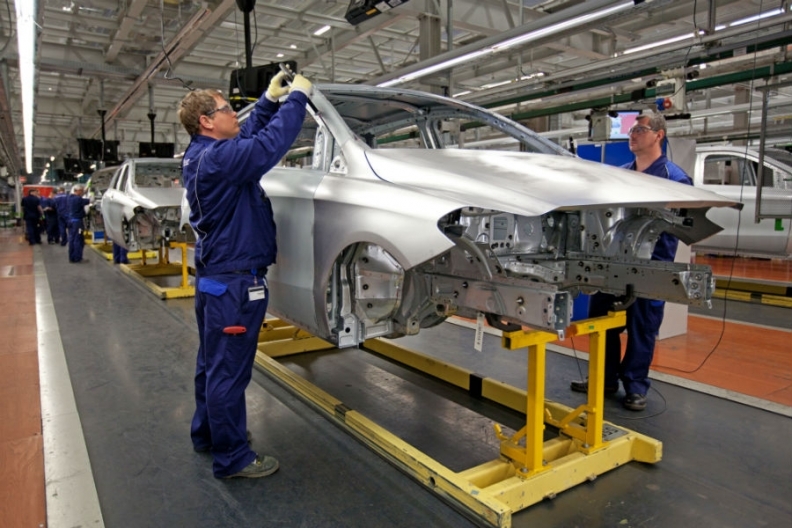 The Kecskemet plant, southeast of Budapest, started production of Mercedes B-class cars in March 2012. The report said the capacity expansion would cost several tens of billions of Hungarian forints and Daimler, Mercedes' parent company, had already contacted the Hungarian government about the project. Hungary's Economy Ministry said any further expansion plans by car manufacturers would be welcome but declined to comment further. Built at a cost of 800 million euros, the plant has been one of the biggest foreign investments made in Hungary in recent years. Hungary's economy, which is heavily reliant on exports, has slipped into recession in the second quarter and Mercedes and rival Audi's production plants are vital amid depressed domestic demand. In total, Daimler has invested 1.4 billion euros ($1.9 billion) to build a new generation of compact premium cars in cars in Hungary, Germany and China.